Anna Bolton | Greene County News Defense Attorney Peter Certo and defendant Kathy Smith turn to look at a photo marked as evidence Jan. 28 during trial as Ohio State Highway Patrol Trooper Jaysen Kelly testifies. Judge Stephen Wolaver looks on. XENIA — Audience members cried quietly on the benches in Courtroom One Jan. 28 as a woman identified a photo of her late husband, killed in the rainy back-road two-vehicle accident that she survived three summers ago. “That’s my husband, Raymond,” Linda Deyo, 68, said on the witness stand before the jury inside Greene County’s courthouse. Nearly two and a half years after the deadly crash, the driver of the second vehicle is on trial. Kathy Smith, 65, of Xenia, is charged with two counts of aggravated vehicular homicide, second-degree and third-degree felonies, one count with mandatory imprisonment; two counts of aggravated vehicular assault, third-degree and fourth-degree felonies; and operating a vehicle under the influence of alcohol and/or other drugs, a first-degree misdemeanor. 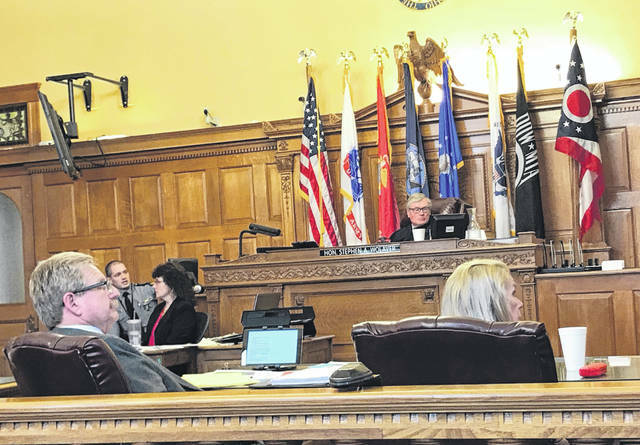 The Bowersville couple was headed home from an auction Aug. 27, 2016, Deyo testified, and had turned onto Hussey Road in Caesar Creek Township when their 2004 Toyota Tundra was hit. It was raining, Deyo said. Her husband, Raymond Deyo, 68, was driving. Deyo said she woke up next in a Kettering hospital with a concussion, broken pelvis and bruised ribs. She said she also had her gallbladder removed, back surgery, and hernia surgery. During trial this week, attorneys are disputing whether or not Smith, who also suffered injuries, was intoxicated or driving recklessly at the time of the collision. According to Assistant Prosecutor David Morrison, Smith’s Blood Alcohol Concentration (BAC) was .343. “We believe the evidence will show that Ms. Smith was intoxicated and she was, in fact, driving recklessly,” Morrison said to the jury. Defense Attorney Peter Certo, in his opening arguments, agreed that Smith’s BAC was recorded as four times the legal limit, .08, for driving in Ohio. Certo said later in the trial, an independent doctor who reviewed Smith’s medical records will testify that the blood alcohol test was “a bad test” and that it is “medically impossible” for her to have had that BAC at the time of the accident. Along with the medics, Ohio State Highway Patrol Trooper Jaysen Kelly responded to the scene. Kelly, who reconstructed the crash, testified that based on the severity of the damage to both vehicles and the conditions of the roadway, he believed that Deyo’s truck had been traveling eastbound at 40-45 mph and Smith’s Chevy Cruze had been traveling westbound at 67-77 mph. That stretch of Hussey Road has a 55 mph speed limit, according to the trooper. Kelly said his reconstruction also led him to conclude that the Chevy Cruze had gone left of center. He said if there had been any standing water on the roadway — which he couldn’t determine — then that likely would have caused a hydroplaning effect based on the Chevy’s speed and tire tread. Photos, marked as evidence and put up on the screen for the courtroom to see, showed a red compact car in a field, its doors open, its entire front crushed, its engine lying several feet away. And a white pickup truck across the road, air bags deployed, left bumper crushed, its driver’s side door out of place. The state will continue presenting testimony 8:30 a.m. Tuesday, Jan. 29 in Judge Stephen Wolaver’s courtroom. https://www.xeniagazette.com/wp-content/uploads/sites/32/2019/01/web1_CertoSmith.jpgAnna Bolton | Greene County News Defense Attorney Peter Certo and defendant Kathy Smith turn to look at a photo marked as evidence Jan. 28 during trial as Ohio State Highway Patrol Trooper Jaysen Kelly testifies. Judge Stephen Wolaver looks on.